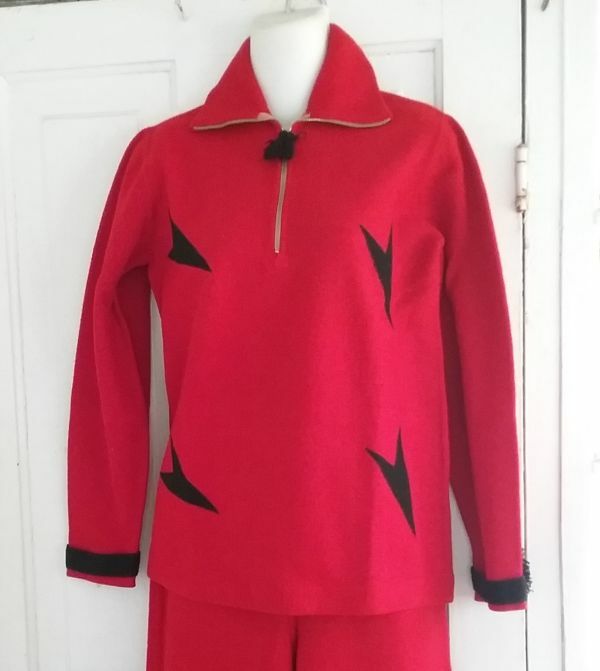 I’ve not been very lucky lately in the sportswear ephemera department, but then this catalog appeared on eBay. 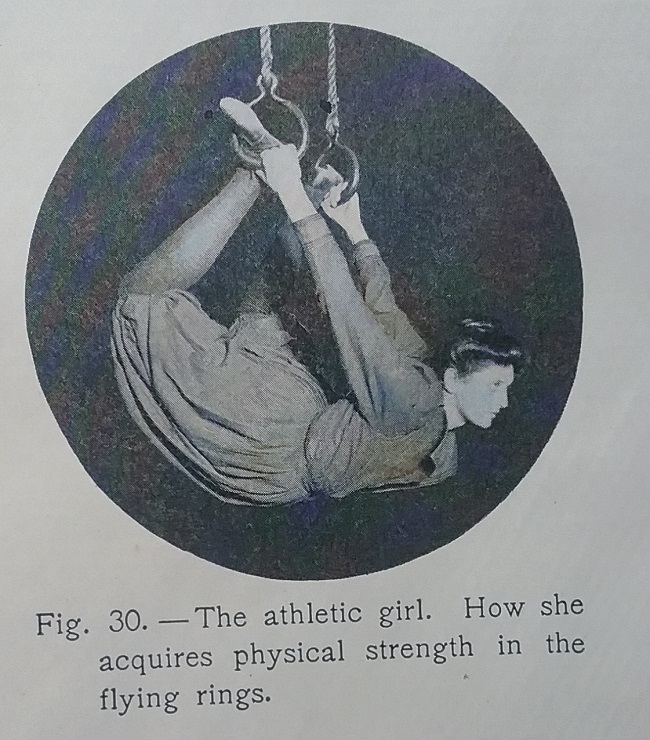 It’s precisely the type of thing I love as it shows how women began wearing ready-made sportswear in the very early days of women’s ready-to-wear. 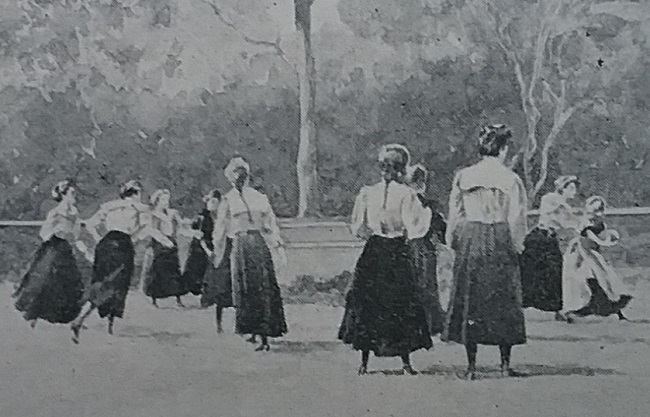 It’s hard for us today to imagine, but until late in the nineteenth century there pretty much was not a women’s ready-to-wear industry. 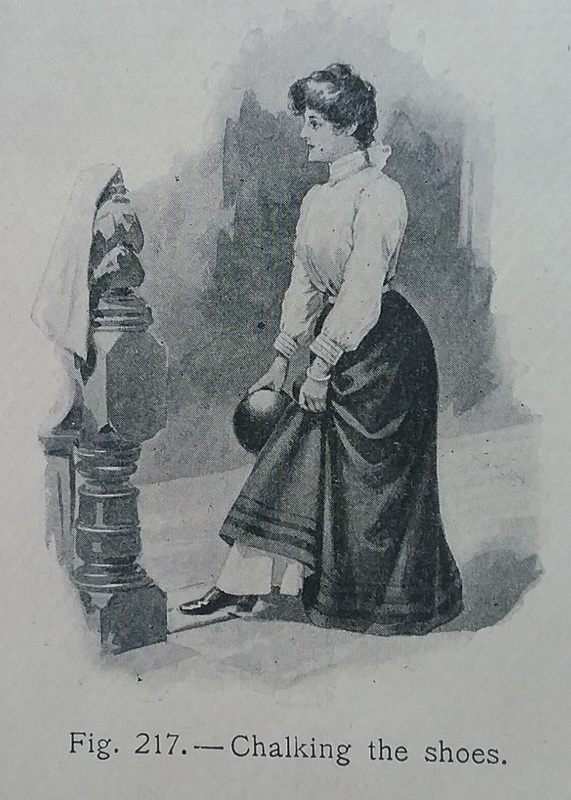 Cloaks and mantles – overgarments that did not need precise fitting – were the first to hit the market, and by the late 1890s, women could buy waists, skirts, and undergarments. 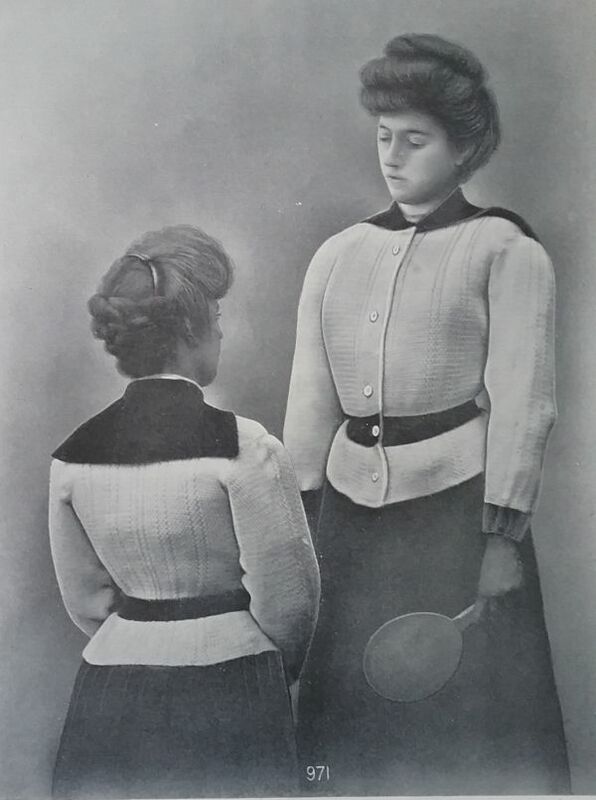 There’s no date to be found on my Mervin Knitting Mills catalog but a close examination of the models shows they are all sporting the S silhouette so popular in the Edwardian era. 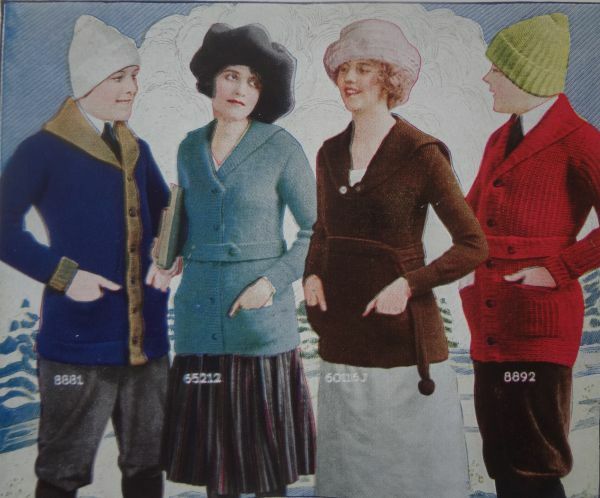 I did find one ad for Mervin, from 1909, and those sweaters all had a longer and leaner line, in keeping with how fashion was changing. 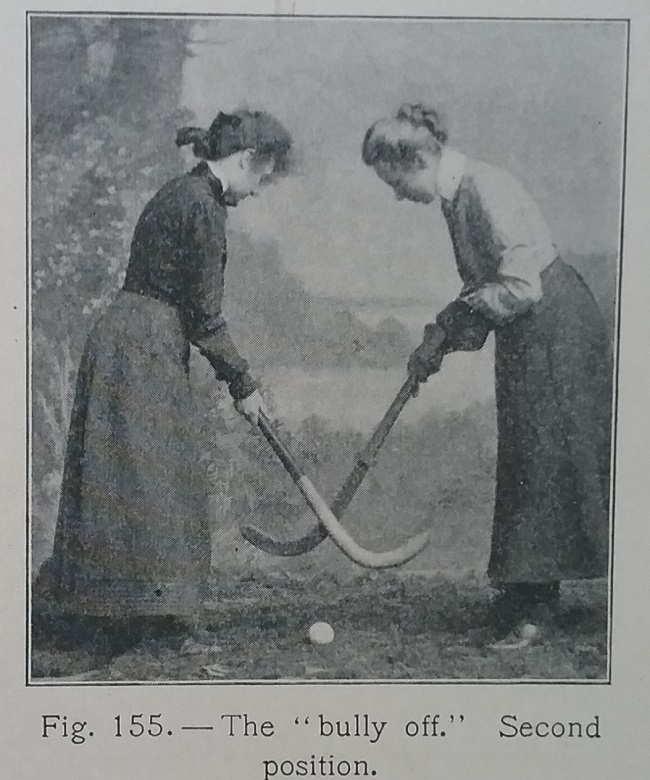 So my best guess is around 1905. 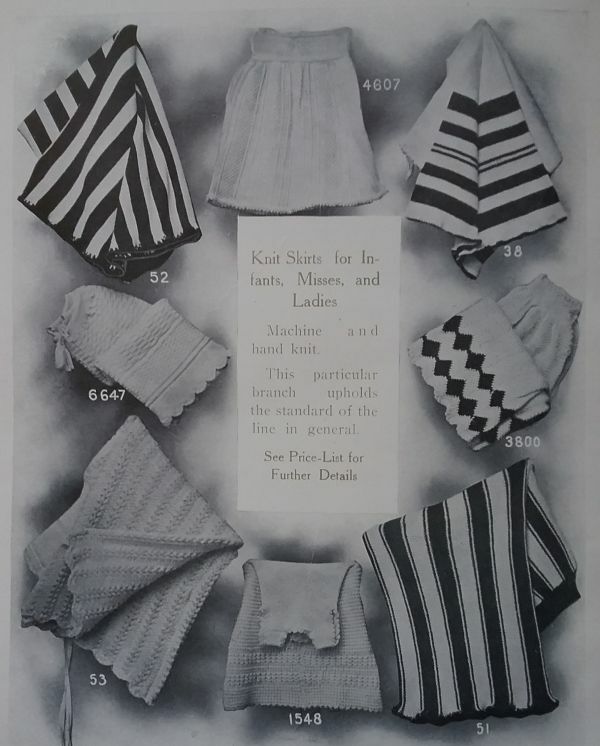 Mervin made and imported a large variety of knit goods for women and children. 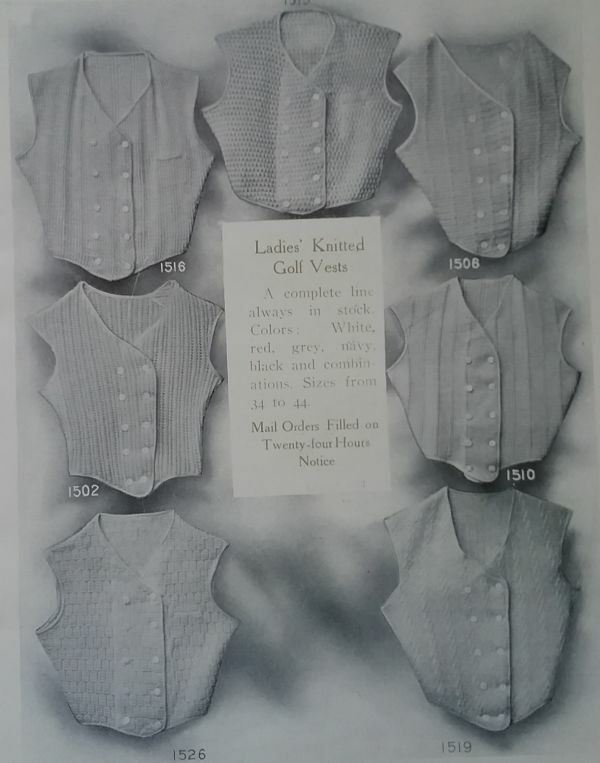 We’d call the garments shown above cardigans or sweaters today, but Mervin Mills marketed them as knit blouses. 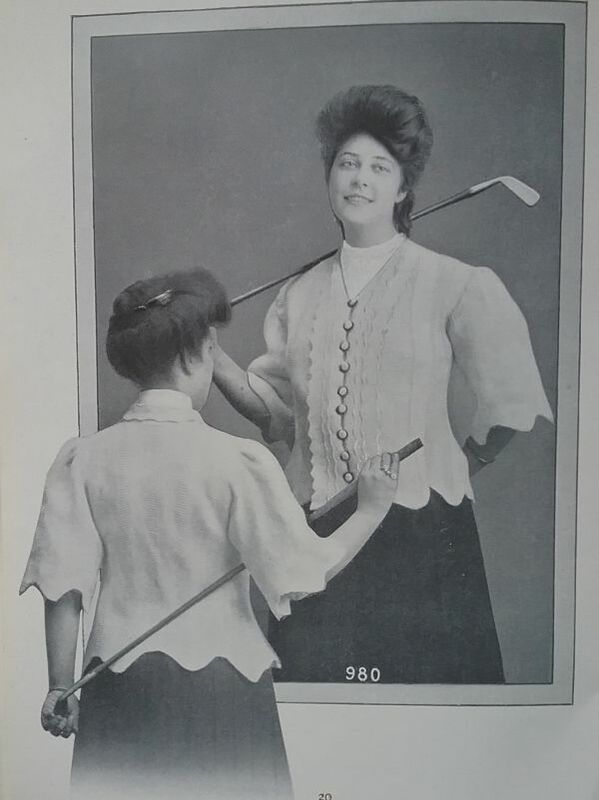 In many of the photos the models are holding golf clubs. 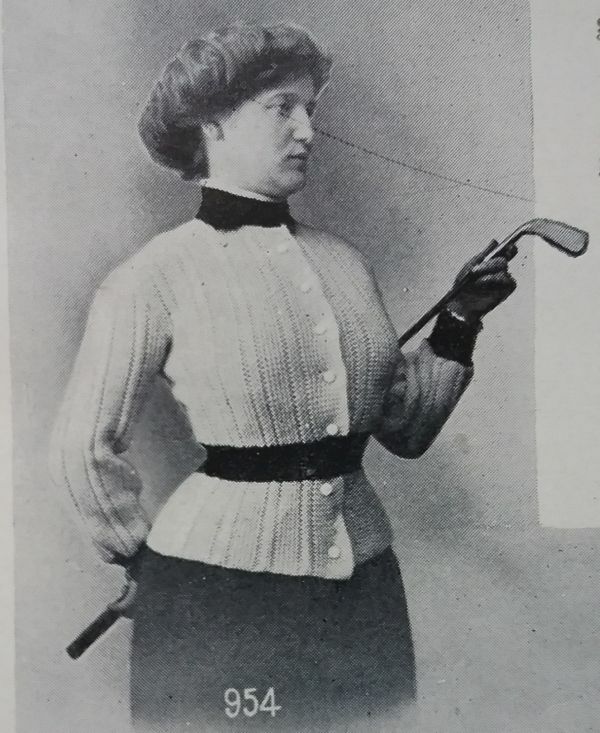 Being knit, golfers must have really enjoyed the freedom a knit provided. 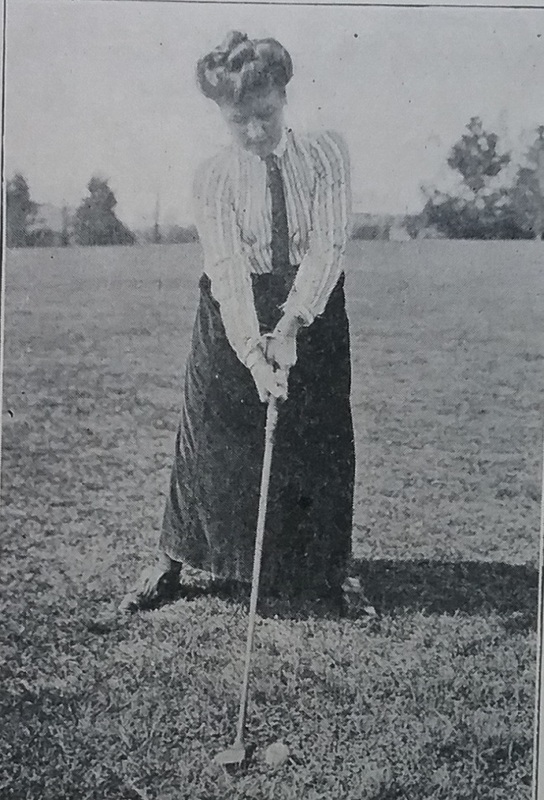 Many of the images of women golfers of this era show them wearing a double-breasted vest like the golf vests above. The only one I’ve actually ever seen was in an exhibition at the DAR Museum in Washington, DC, several years ago. 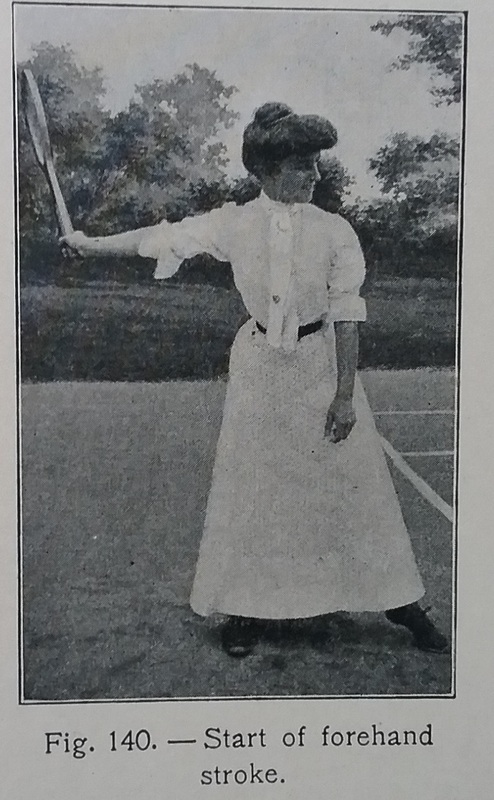 Mervin Knitting Mills even offered a knit middy, perfect for table tennis. 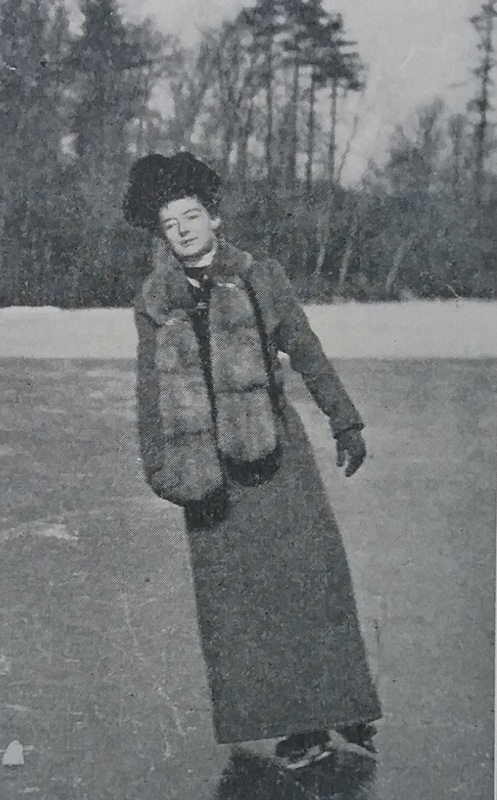 Knit toques like these are commonly seen in photographs of the era, but are very rare these days. Knit skirts like these do make it to the modern market on occasion. They are usually sold as petticoats, and I’ve seen them in period catalogs as petticoats. It would be a shame to hide those stripes though, don’t you think? 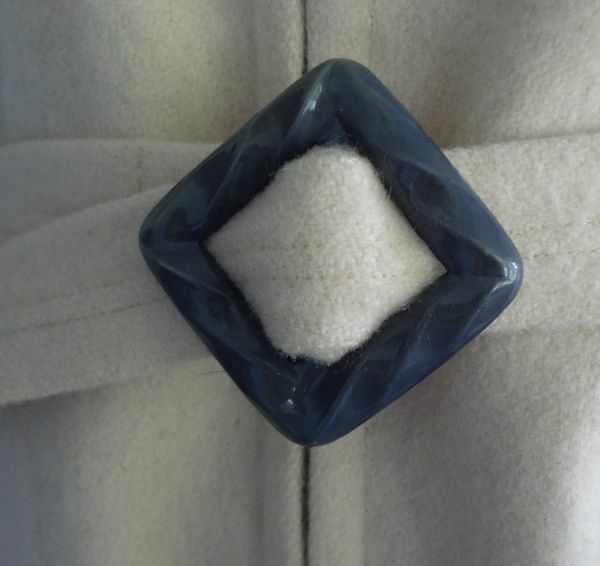 This garment was listed as a “kimona” coat. It looks a bit fancy for the golf course. Witness2Fashion has been looking at the different terms given to various forms of lingerie in the 1920s, many of which have changed meaning or are no longer in use. 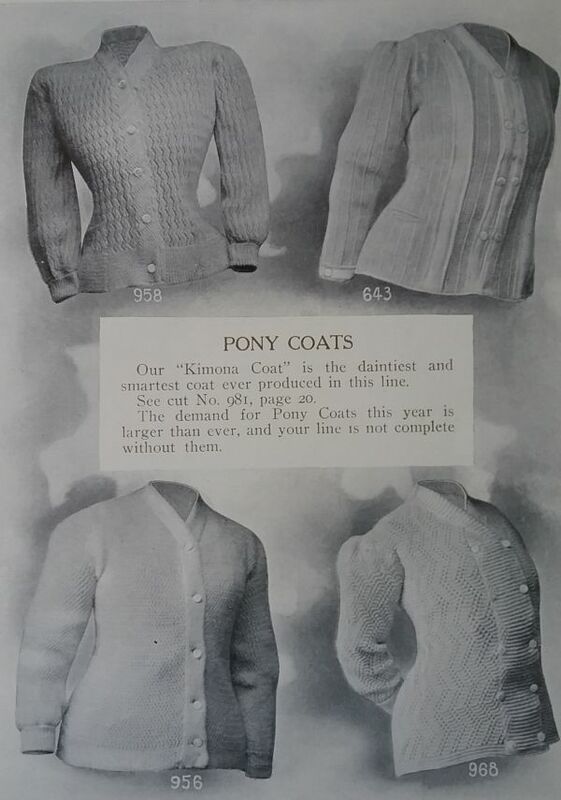 Well, here’s a term I’ve never seen before, the pony coat. 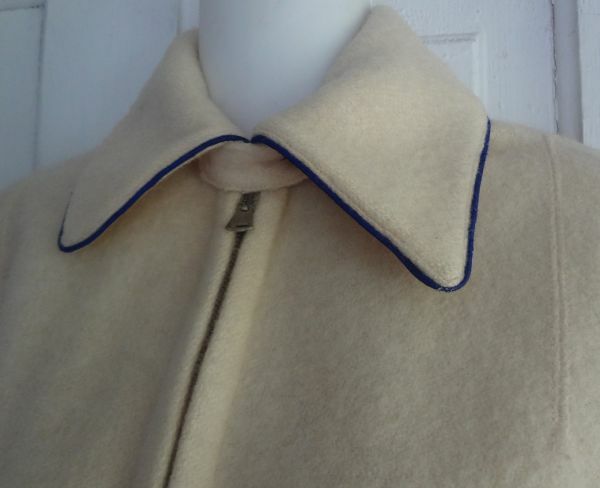 What makes the cardigans above pony coats? I have no idea. 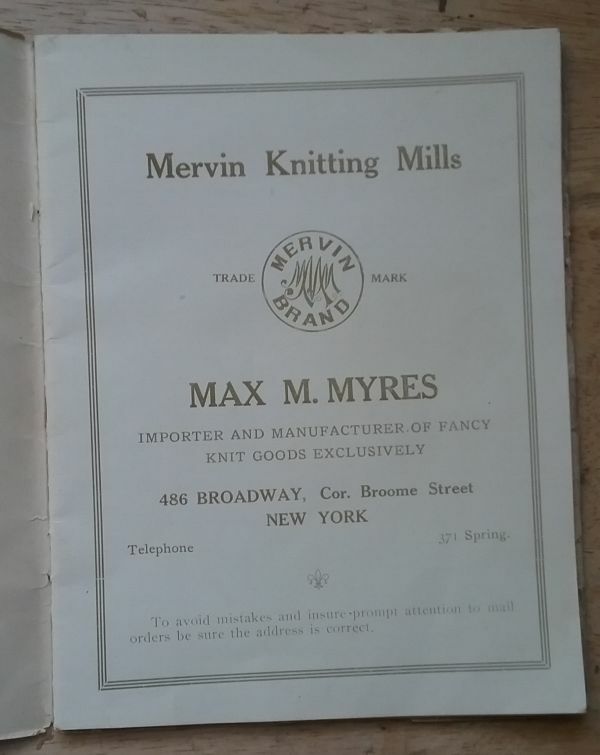 Just in case some descendant of Max M. Myres is looking for information, he was the owner of Mervin Knitting Mills. located in New York City on Broadway at the corner of Broome Street. Today a Madewell clothing store occupies that address. I hope you weren’t expecting wedding photos, as this is a different type of marriage. It’s a marriage of objects that started life in the same place, were separated, and are now reunited. 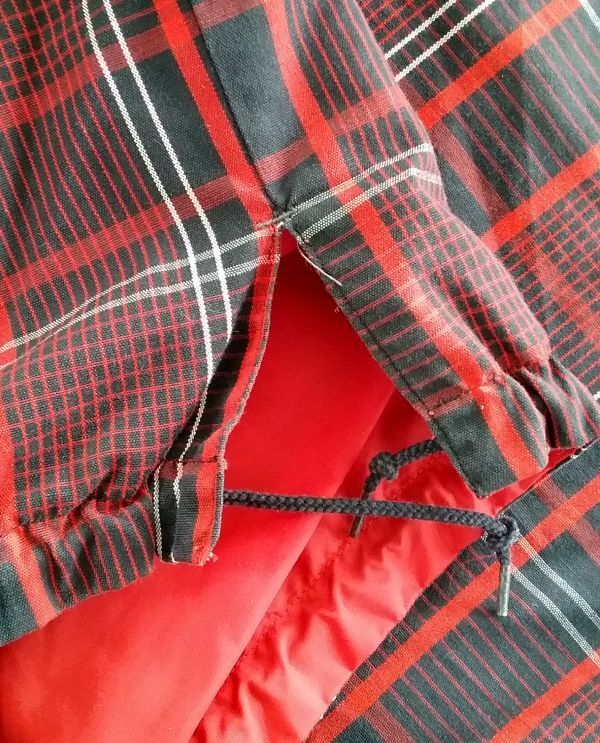 I found the plaid parka three or four years ago in an antique mall here in North Carolina. For a while it actually resided in my own closet, but I was afraid to wear it because it was so pristine. So for over a year it sat, waiting for a companion to make it complete. Then, out of the blue, I got an email from my friend Hollis of Past Perfect Vintage. She had a pair of ski pants that she thought I might be interested in. After seeing photos, I knew I was interested. I had found (or rather it found me) the mate for my parka. A bonus was that the pants were unworn, and even had the original hangtag attached. And look at the little White Stag logo charm. 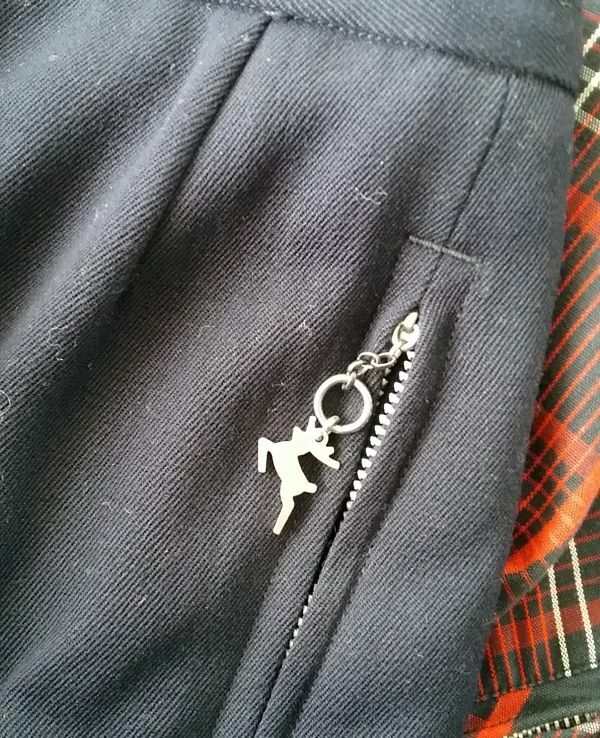 Here you see that the parka has the same charm as the zipper pull. 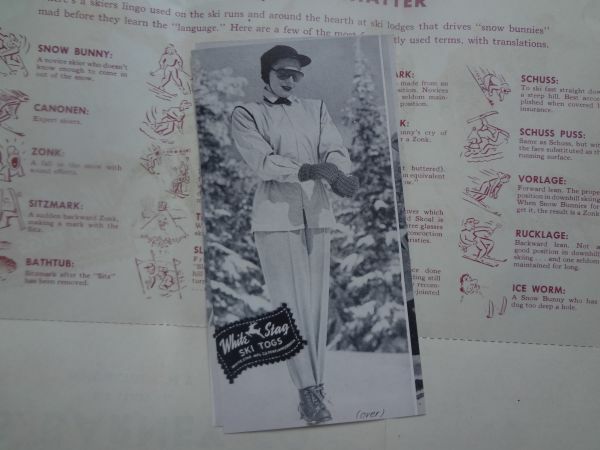 I’m not sure how long White Stag used the charm, but I have only seen it on garments from the late 1950s and early 1960s. Also in the category of Things I Don’t Know, is the issue of labels. 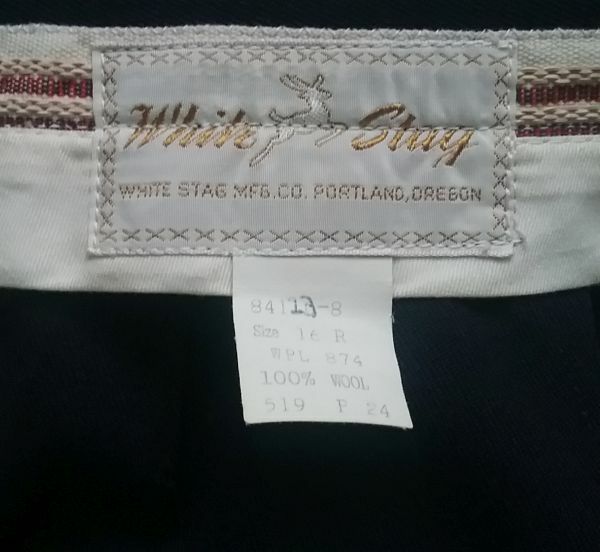 Up until around 1960 White Stag used blue or red labels. At the same time, the colored labels were replaced with a white label with gold lettering. It’s likely that the use of the labels overlapped. It’s also possible that the pants are a year older than the parka, but the blue is identical and the match is perfect. Both pieces are very well made, as is seen in White Stag active sportswear of this era. But not long after these pieces were made, things began to change at White Stag. 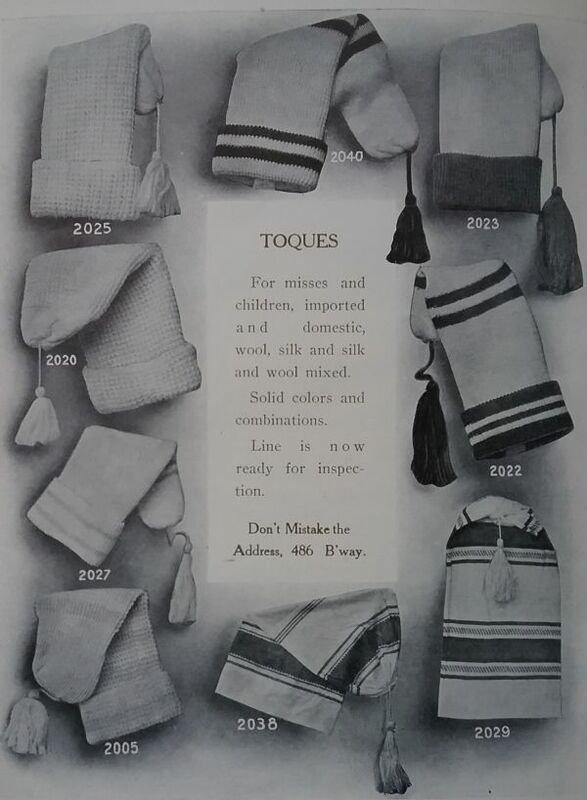 I once had a conversation with a former executive of the company who told me that sometime in the 1960s White Stag decided to go in a more “fashion” direction. 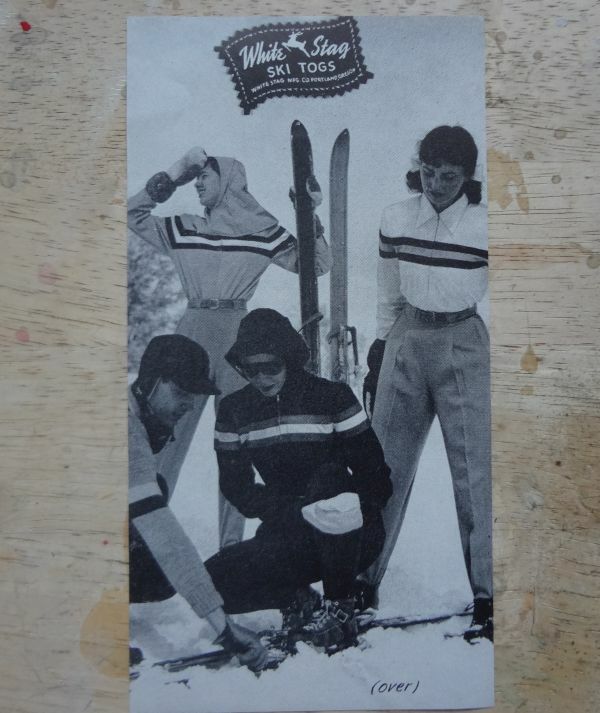 The ski wear became more about looks than about function, and was eventually just phased out. If you see White Stag items from the 1970s and later, you will see what he was talking about. 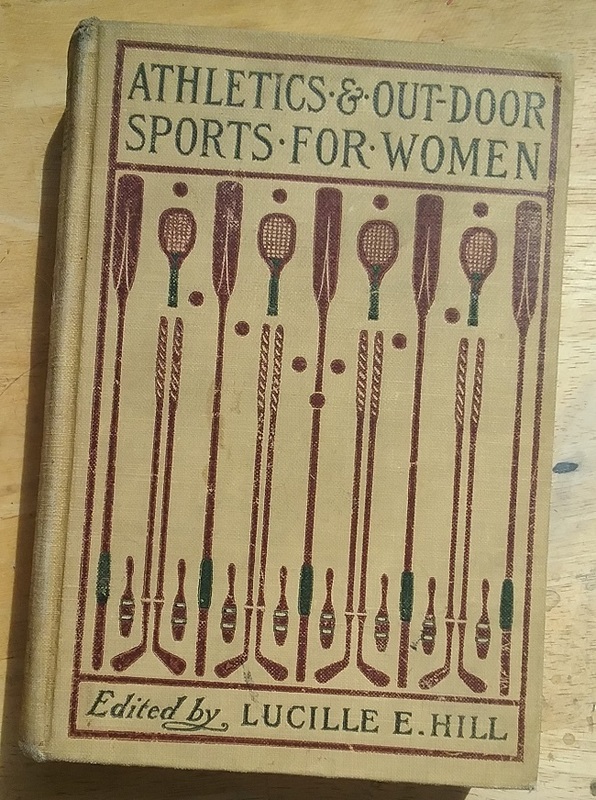 But my set is functional for outdoor sports. The parka is lined in waterproof nylon, and the hood fits tightly to the head without affecting visibility. 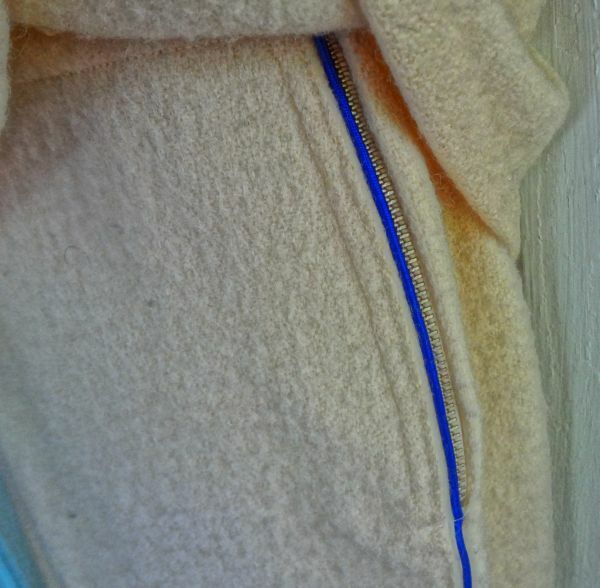 There is a drawstring at the hem so it can be adjusted to suit the wearer. 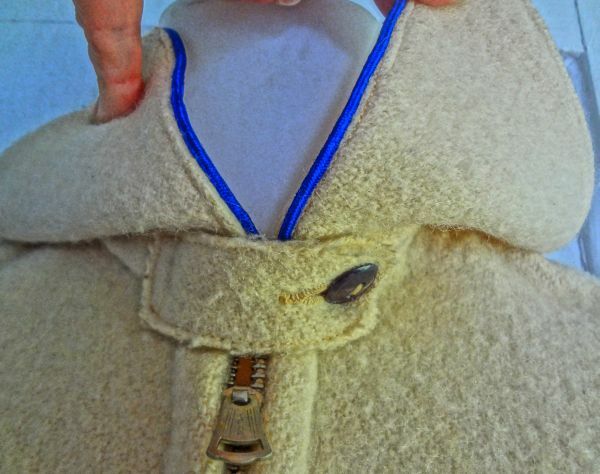 And all the pockets are deep and are zippered. 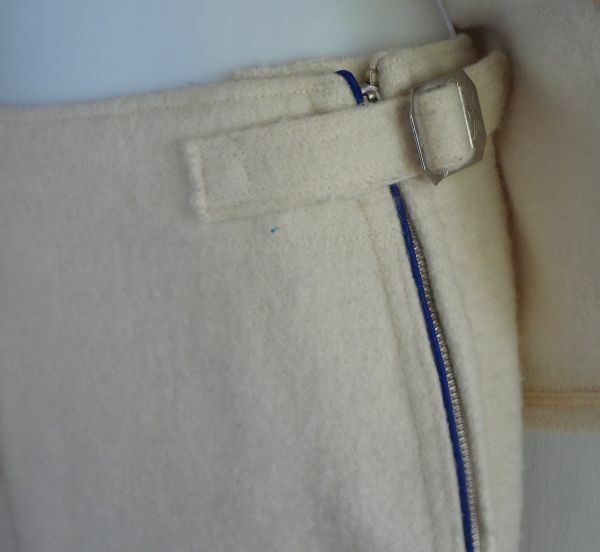 The pants pockets are also zippered, and the hems of the pants are slightly flared to allow one to easily pull them on. 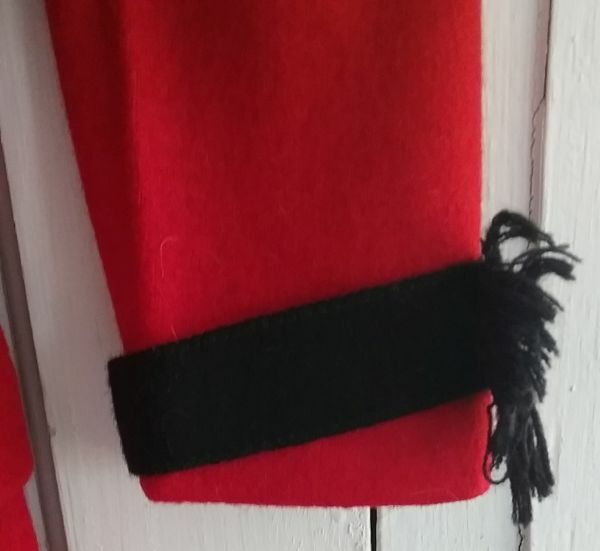 And there is a wide elastic strap to hold the legs securely under the boots. As Hollis said to me when I got these, it really does pay to let people know what you collect. I’ve gotten a lot of great items from sellers who have learned my collecting needs. And check out Hollis’s shop and Instagram. 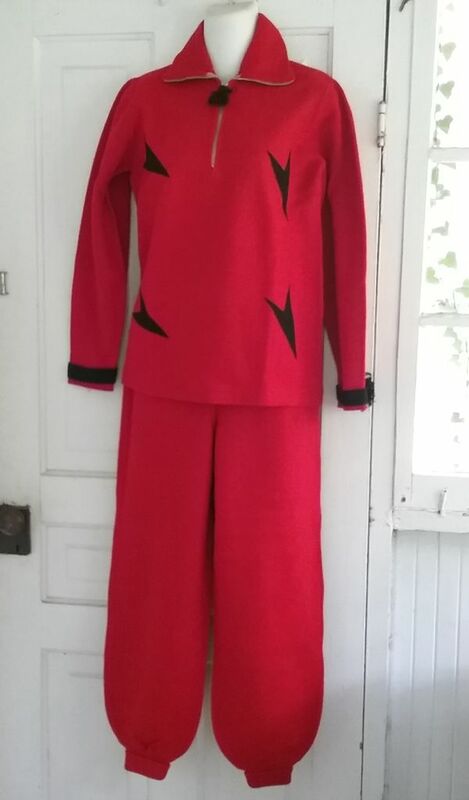 She sells some of the best vintage clothing on the net. A note about my photos. I know they are bad. I have lost my “good” camera, and I obviously have not mastered the art of smartphone photos. Please bear with me! If you have been reading The Vintage Traveler for a while you already know that Bradley is one of my favorite vintage brands. 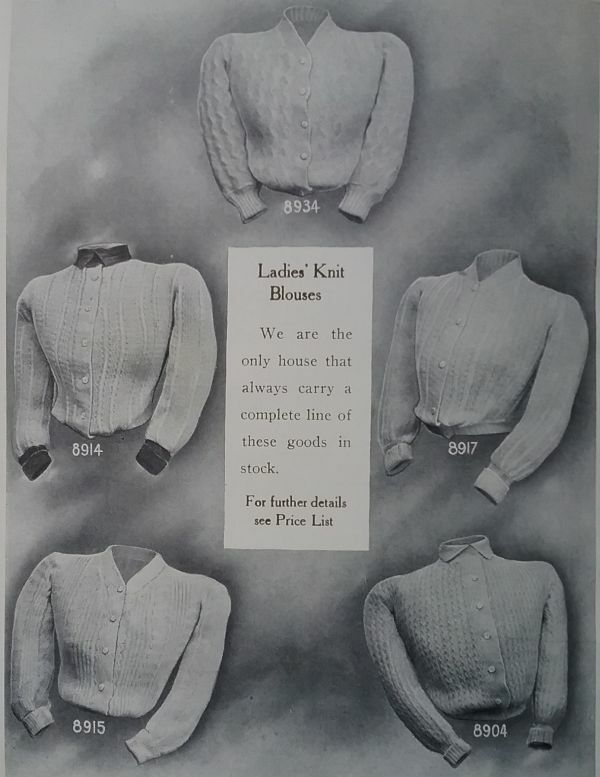 Bradley Knitting Company was located in Delavan, Wisconsin, and was established in 1904. 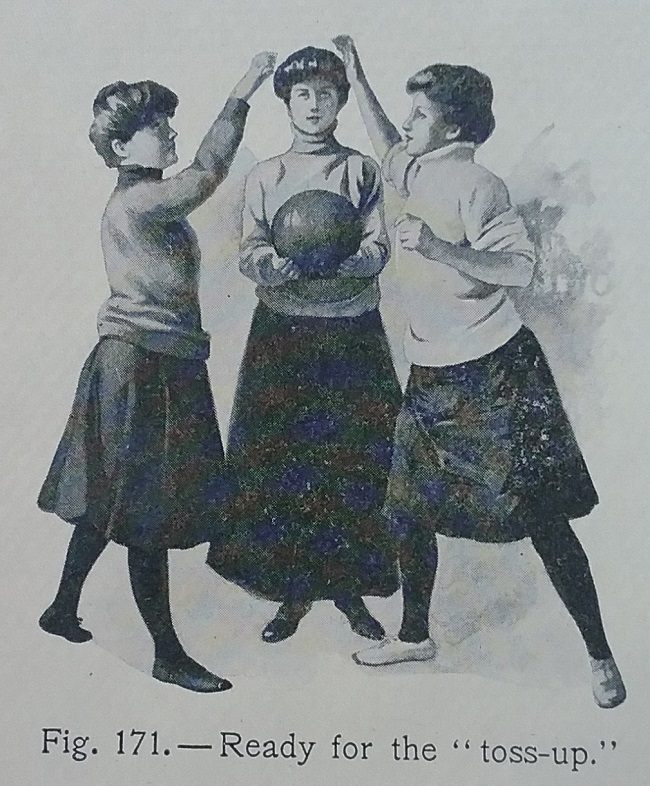 They made all kinds of woolen knit goods, including swimming suits, sweaters, and other sports apparel. This company was very important to the small town of Delavan as it was their chief employer, with 1200 persons working there when the company was at its peak. In fact, they often had to advertise in larger cities in order to keep enough workers. 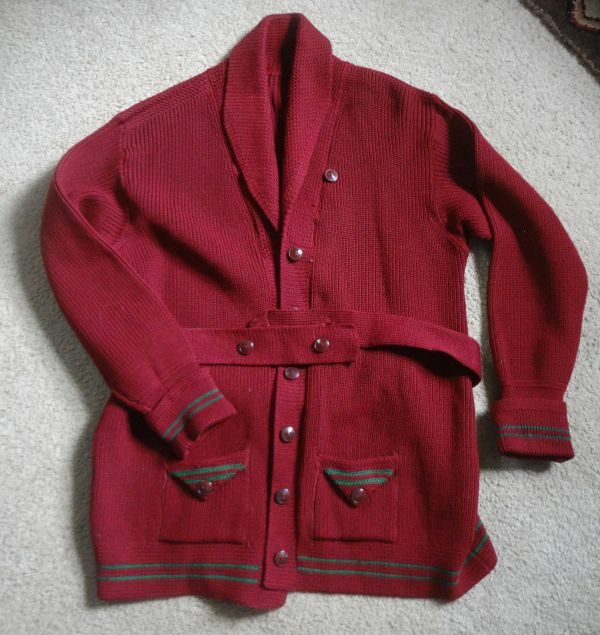 When I first spotted this set on etsy, I was confused because at the time it was made (late 1920s or very early 30s) Bradley was making only knits, and from the photos in the listing, these pieces looked to be woven. I was pleasantly surprised to get the set and to find they were actually knit. 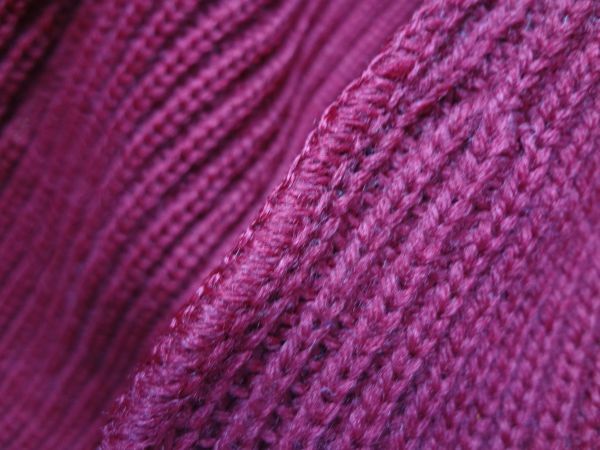 Yes, this is a knit, though it is hard to tell from this photo. 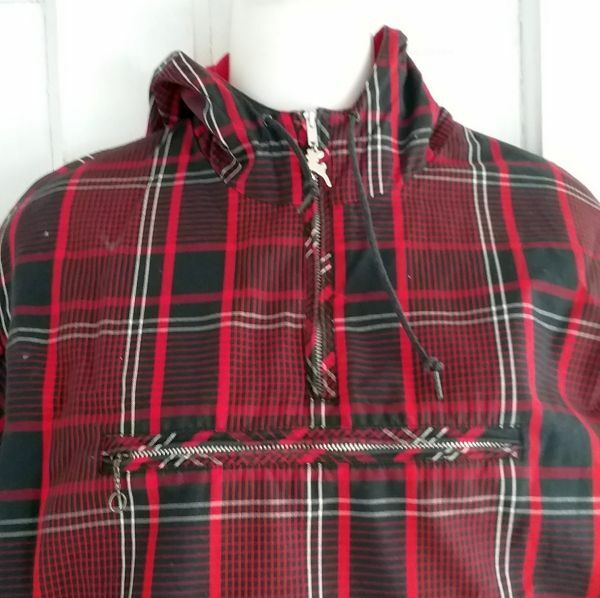 Another interesting thing about the top is the use of the zipper. 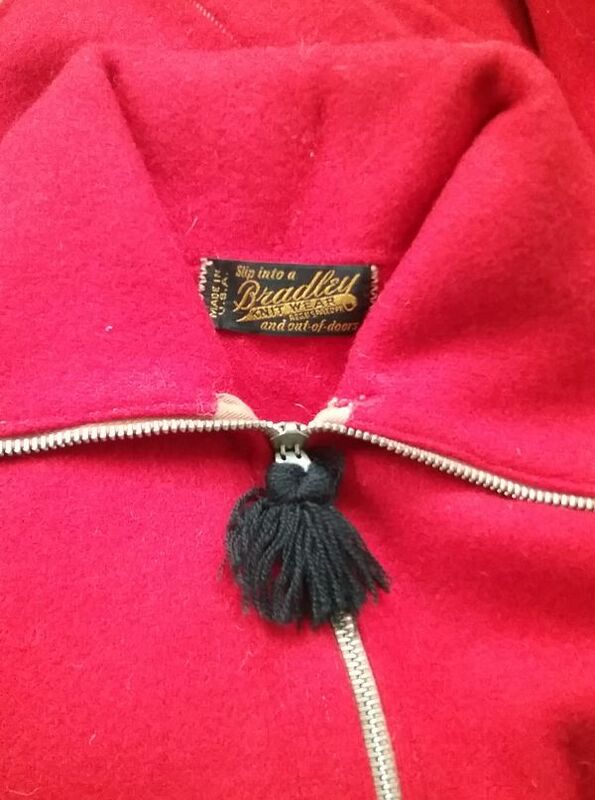 Even if this dates from 1930 the use of the zipper in a garment is a very early example. 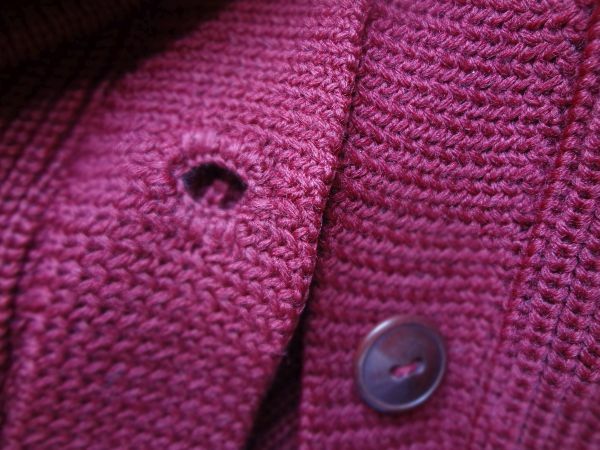 These little black arrow accents were not knit in; they are appliqued on top of the garment. 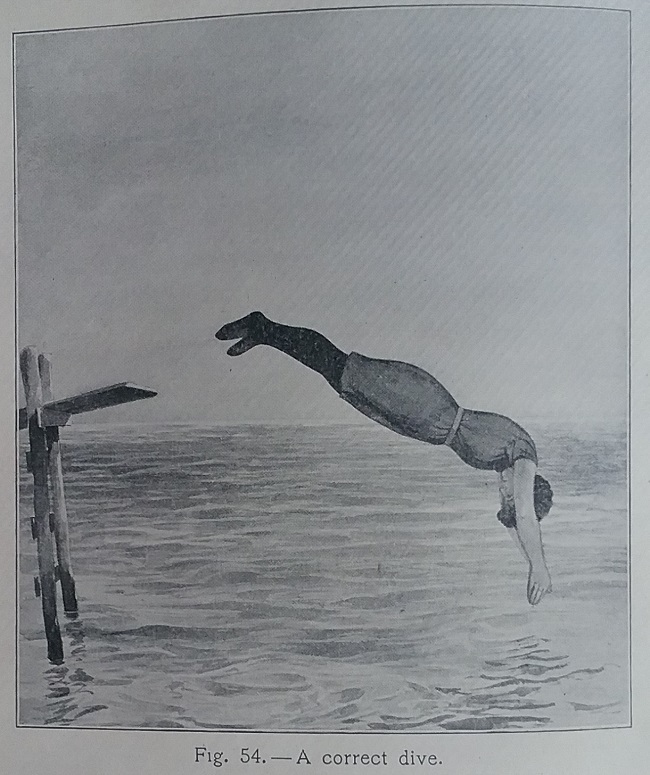 You see this feature quite a bit in late 1920s bathing suits in a nod to the geometric designs of Sonia Delaunay, perhaps. The straight bodice of the top is another hint to the date of the set. 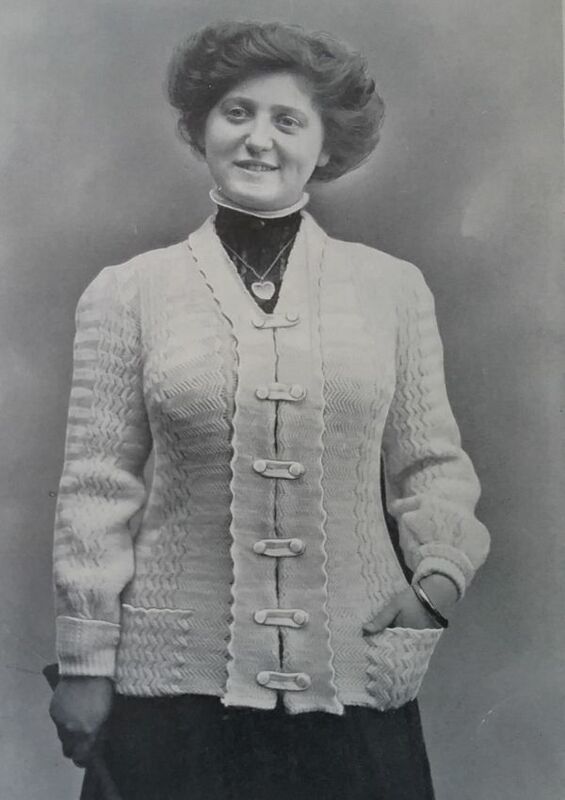 After 1930s jackets became shorter, often ending at the waist. This piece still has the long straight look of the late 1920s. And what is an old wool garment without a few moth nibbles. I’m showing you this because here you can actually tell that this garment is knit, not woven. 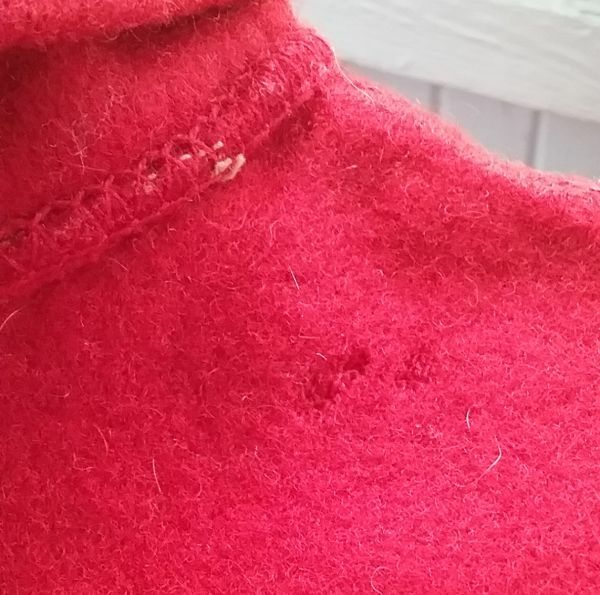 I also want to draw attention to the overlock stitching where the collar is attached to the bodice. 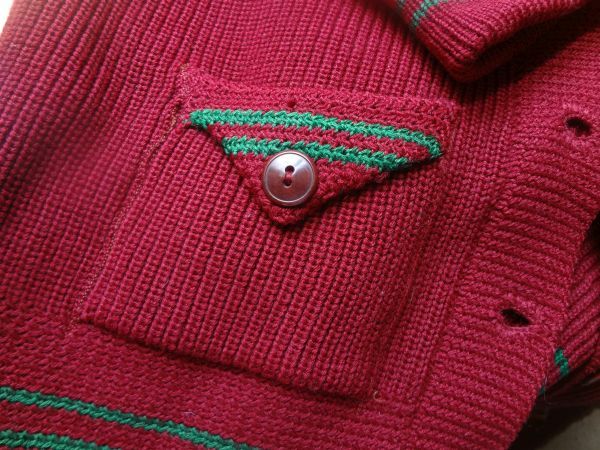 There are some vintage sellers who insist that you don’t see overlock before the 1970s, but that is simply not true. 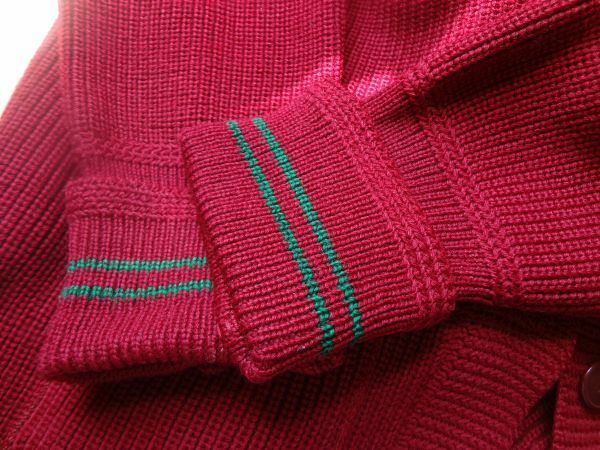 It was commonly used on early sweaters and other knits, having been invented in the 1880s. 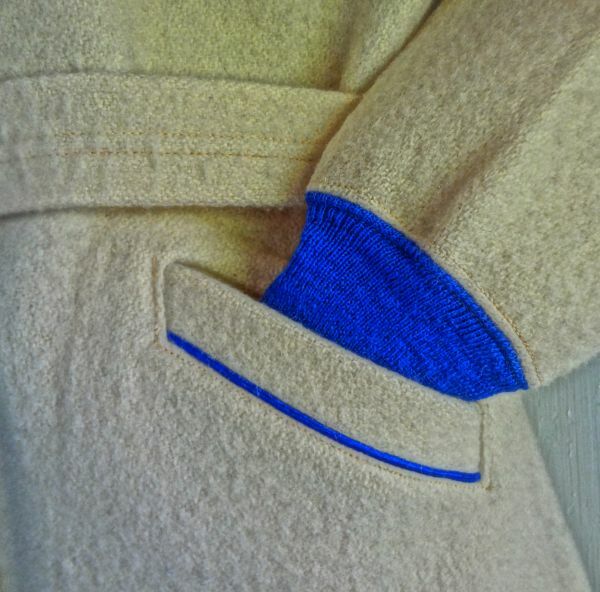 A bit more applique is found in the bands at the sleeve cuffs. And what about that tassel! 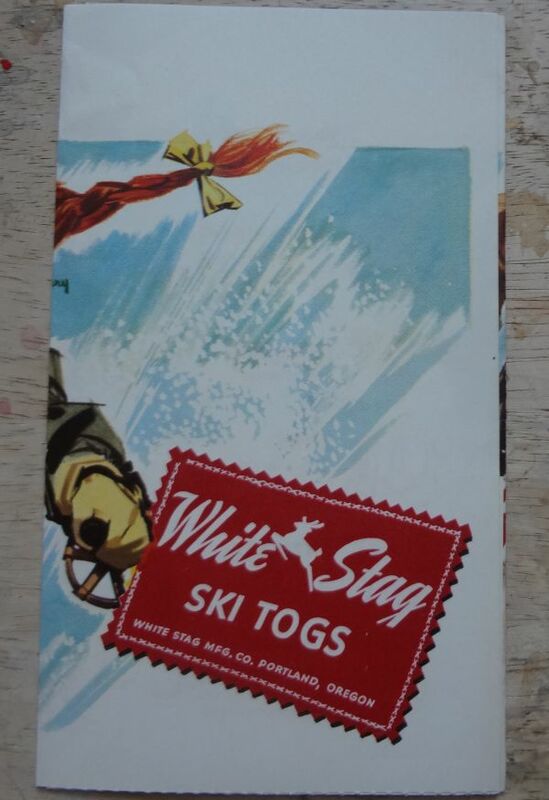 A recent addition to my sportswear archive is this little folder from White Stag of Portland, Oregon. 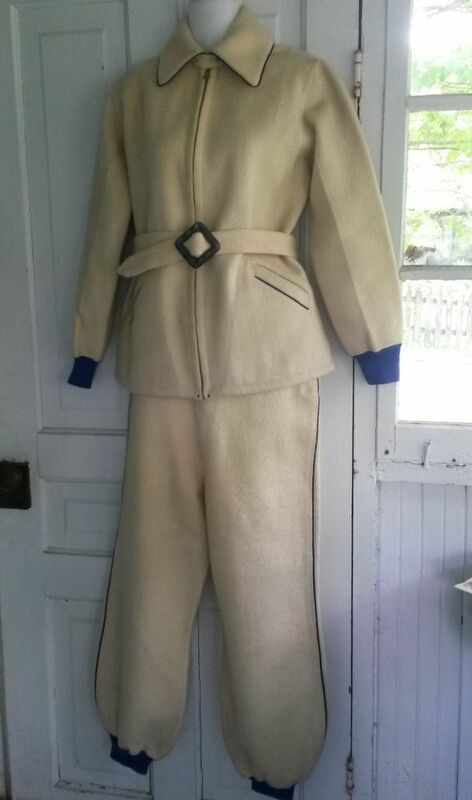 It isn’t dated, but from the style of the clothing, I can say it is late 1940s. Thanks to @noaccountingfortaste on Instagram, I can tell you a bit about the illustrator of the cover. 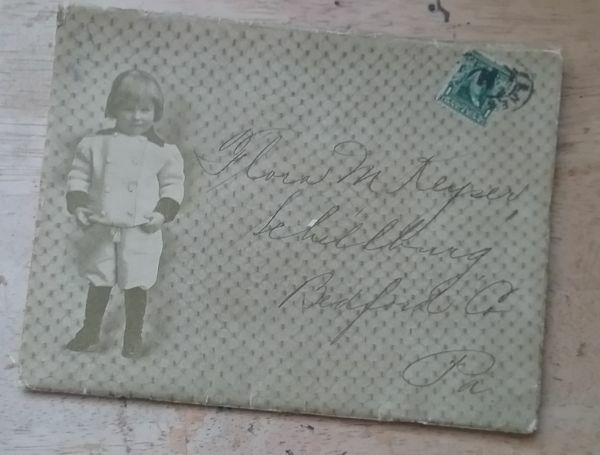 She was Gereldine Olinger Hinkle Abbot, or as she signed this picture, Gerry. 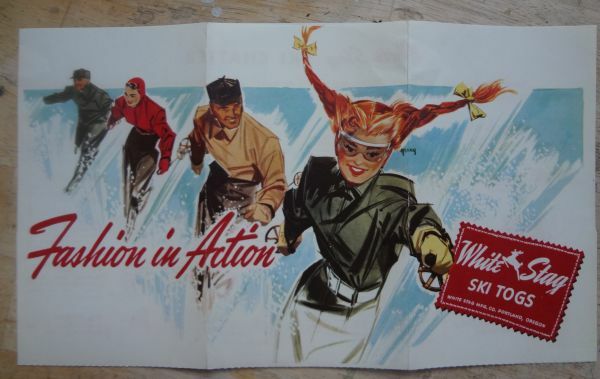 Inside the folder is a little dictionary of ski terms, and several cards that have photos of the latest ski fashions. In this period of time, ski pants, and usually jackets as well, were made of wool gabardine, this is thin and light, though dense and warm. 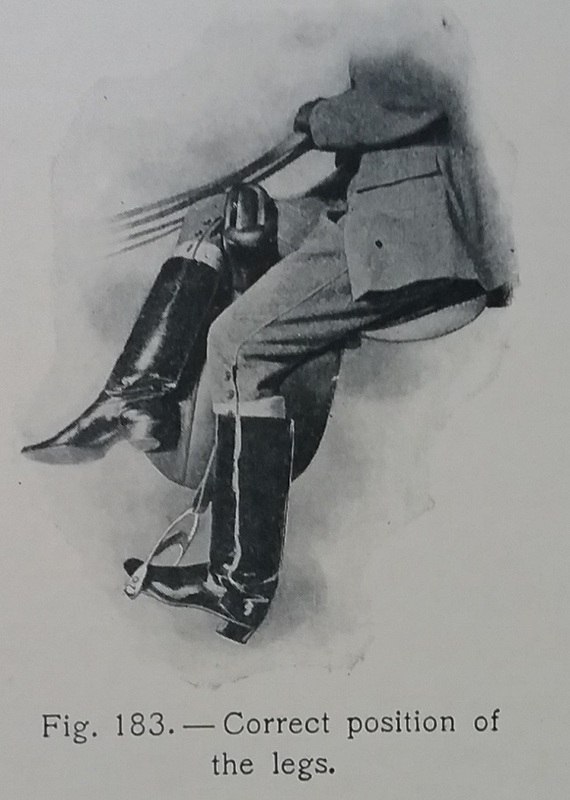 The pants were pleated at the waist to give the wearer greater mobility. 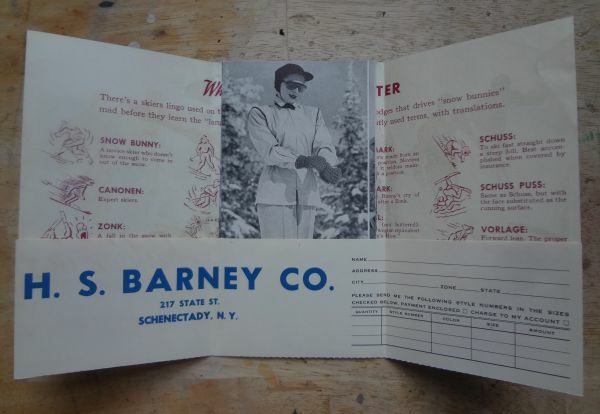 This is a pretty standard ski suit from the late 1940s. The shoulders are still wide, and the pants are roomy. 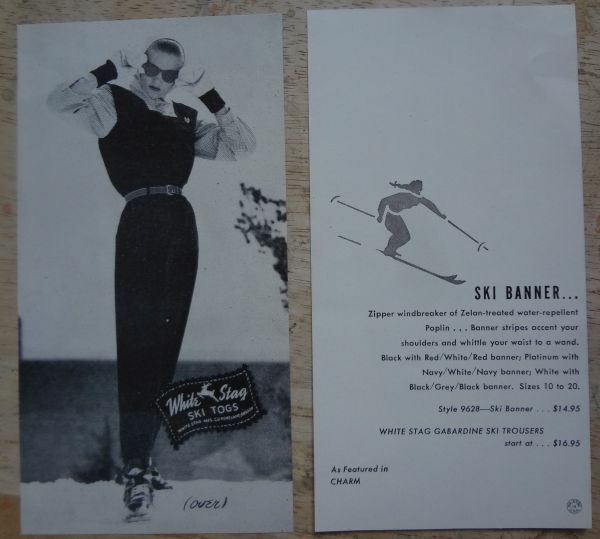 It would be only a few years before Willi and Maria Bogner of Germany discovered that thick nylon knit made a sleek and effective ski pant and changed the style completely. 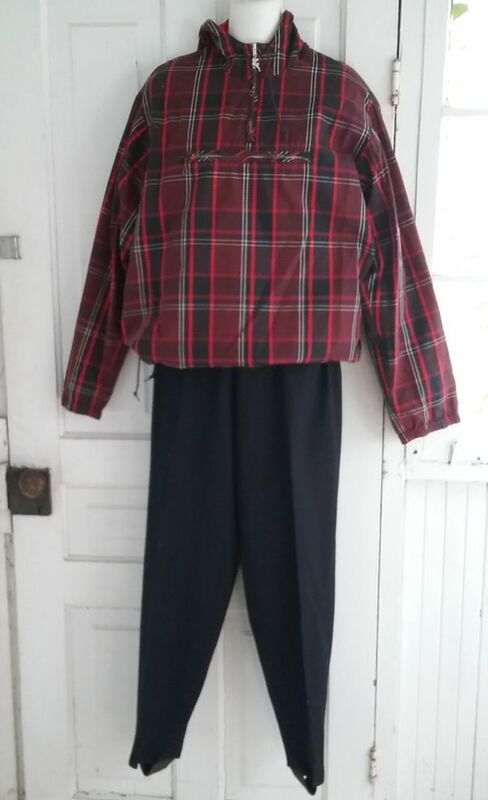 Here the pants are gabardine, but the jackets in made of cotton poplin. 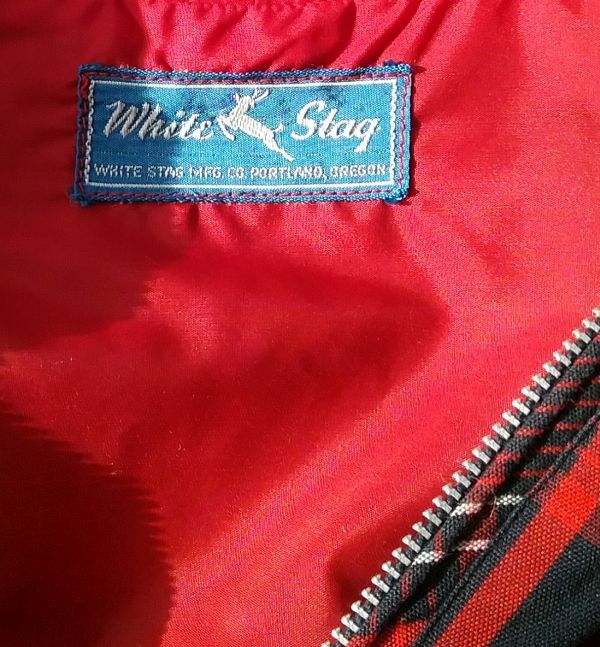 White stag started as a canvas tent makers, and they continued to work with cotton fabrics. 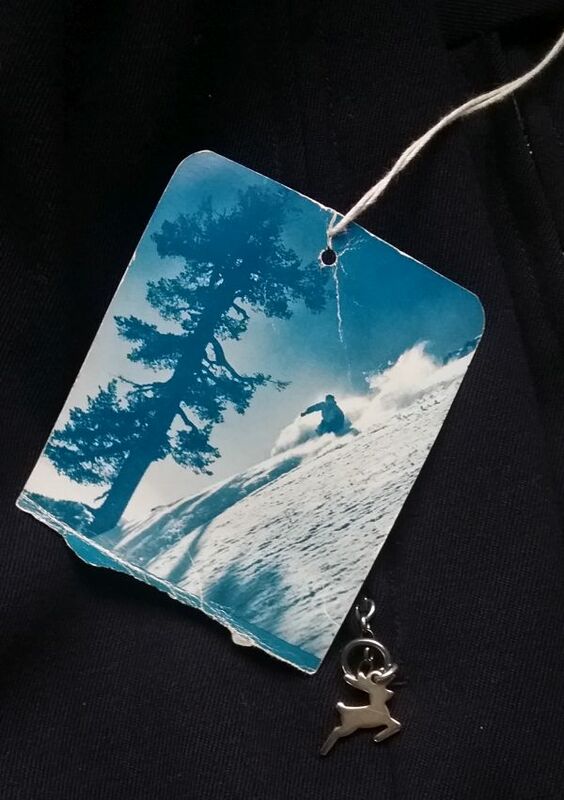 This is the Ski Banner style described in the photo above. On the back of each card is a brief description and the price. At $14.95 and $16.95, these togs weren’t cheap. According to the inflation calculator, the jacket would be 171.63 and the pants would be $194.59 in 1017 dollars.